by The Mechanic's Wife | Jan 4, 2018 | Did You Know? Andrew and I recently went to see a local orchestra and choir perform. It was our first night out together in many months and I was so excited to be enjoying music with him. In case you didn’t already know, Andrew is an accomplished musician with a degree in music education. I was really enjoying the concert and at intermission, I asked him what he thought. Overall, he said he was enjoying it, but pointed out that the orchestra was playing a bit sloppy and the choir wasn’t always in sync. Having a little musical training myself, I had to agree with him, but I couldn’t have pointed each detail like Andrew did. He’s always focused on the details and when he becomes a master at his craft, he takes it very seriously. The same goes for vehicles as it does music. Since we opened the shop in 2015, we’ve had three vehicles come in with broken timing belts. That may not sound like a big number, but for a big problem like this, once a year is pretty significant. 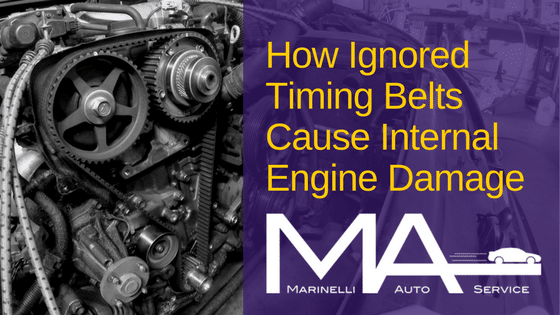 Timing belts are a maintenance item that people often overlook, but it is actually just as important as getting your oil changed because it can cause major damage to your vehicle if it’s past due. It’s one of those things that, when it breaks, leaves you stranded on the side of the road. A timing belt is kind of like the conductor of an orchestra. There are many components that keep your engine running smoothly, but if they are out of sync, the melody and harmony begin to clash, ruining the intended effect of the music. While instruments in an orchestra playing to different beats simply take away from the enjoyment of the performance, an engine out of sync can cause serious internal damage. If it were me, I’d rather listen to a bad orchestra than have a worn out timing belt in my car! In the most basic terms, the timing belt keeps two very important components, pistons and valves, in time so they do not crash into each other. When these engine components get out of sync, they crash into each other, causing severe damage. 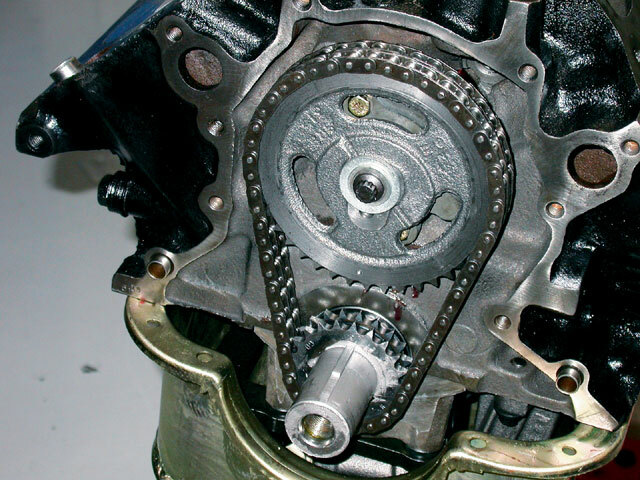 Some vehicles have metal timing chains rather than rubber belts. While they perform the same function, belts are quieter. However, belts wear down with age and miles, so if not replaced at regular intervals, they lose their effectiveness. 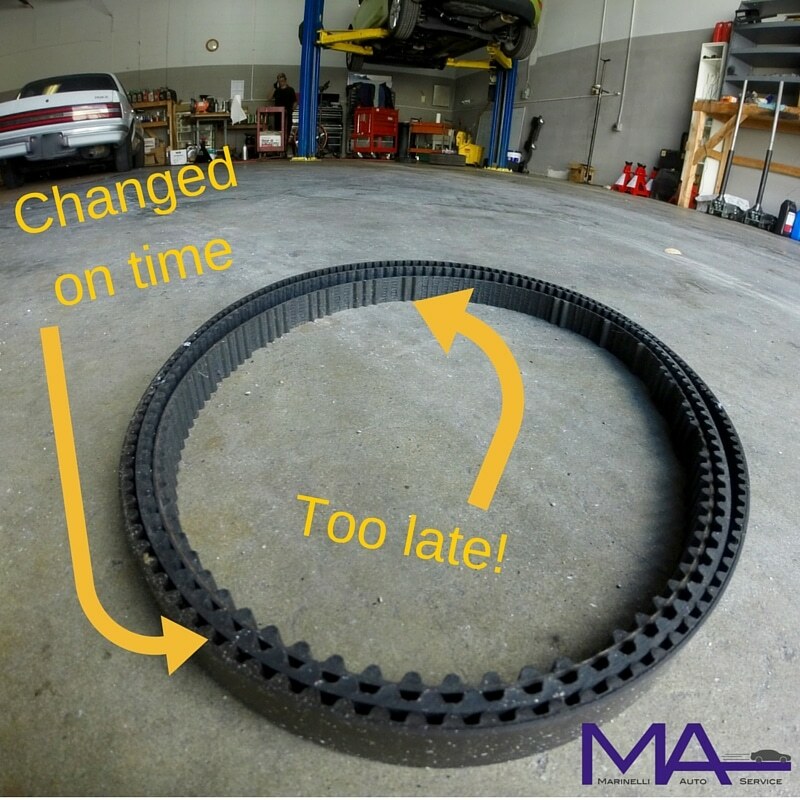 The interval for timing belt replacement varies from vehicle to vehicle and can range from approximately 60,000 to 100,000 miles. Your owners manual should have a maintenance schedule, but it’s always a good idea to discuss it with your mechanic because he/she is apprised of manufacturer schedules and updates for your vehicle. 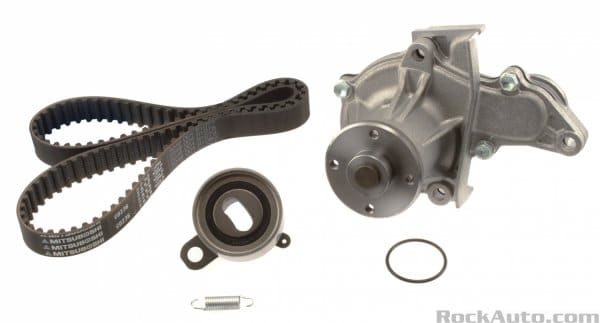 In many cases the timing belt is replaced along with other components nearby. These parts work together and are often due to be changed at the same time or soon thereafter. It keeps the labor cost down to do them all at once and they can often be bought together in a kit. Keeping up on maintenance items like oil changes, brake pads, and timing belts not only keep you safe and keep your car running smoothly, but it also prevents damage that could cost thousands of dollars and keep you without a car for several days. If you do not have a clear picture of what maintenance has been done to your vehicle, or what might be coming up, I highly recommend having a trusted mechanic do a comprehensive inspection on your vehicle. At our shop, that includes providing a list of safety concerns, needed repairs, and a maintenance schedule (including the timing belt) along with estimated costs. If you are like me, you want to take care of your car in a way that thwarts stress in your finances and your daily schedule. I know enough to change the oil and take it in for regular check-ups, but I rely on someone with more knowledge to point out the details. I’m slowly becoming that person for you, but I will no more have a degree in music than I will be a mechanic anytime soon. Hopefully you have a mechanic you trust. If not, please find one. You’ll thank me!